Ever since I saw this awesome ripped denim bag from Michael Kors a few weeks ago, I knew denim patchwork bags would become my newest addiction. I am indeed lacking a pretty bag in the size of those above, but so far I've always hesitated buying one because I like my bags to be extremely versatile so that I can wear them with almost every outfit. 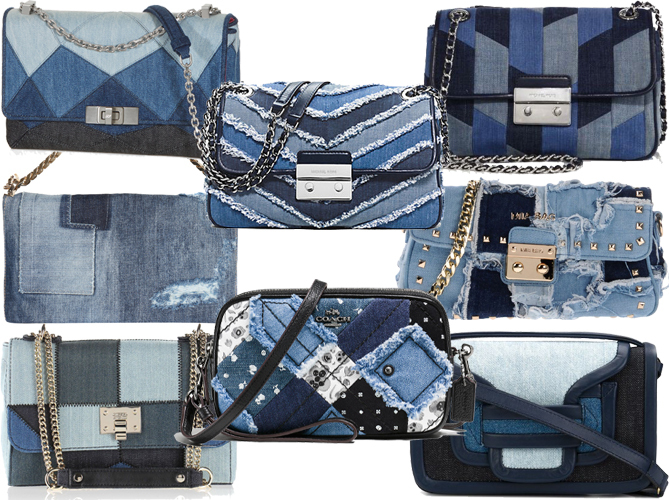 Some of you are certainly wondering what makes a denim patchwork bag so versatile, but regarding the facts that a) denim will always be in style and b) 90% of my outfits are blue and black or white, I think they would be quite a good fit for me. Also they are certainly an eye-catcher without being so fancy that they could annoy me after a few weeks. After all this praising you could think that one of these babies is already on its way to me, but despite all the perfection that is going on in the collage above, I couldn't find a bag that would make me spend 200€ or more just like that. I found a budget version on Asos, which however is more of a denim Chloé Drew dupe and thus doesn't have a shape that I would regard as practical. The Mia Bag above isn't too expensive either, but I prefer silver over golden details for my accessories. Do you think this is a trend that will stick around for a while?